Selma Blair attends the 2019 Vanity Fair Oscar Party Hosted By Radhika Jones at Wallis Annenberg Center for the Performing Arts on February 24, 2019 in Beverly Hills, California. Nearly five months since revealing her multiple sclerosis diagnosis, Selma Blair is sharing her story. 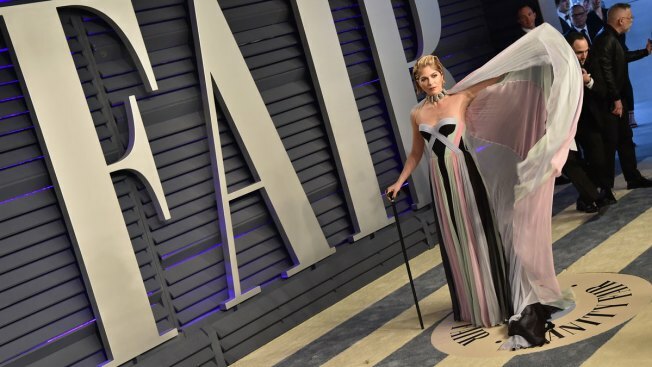 Just days after making her first public appearance since the announcement at the Oscars 2019 Vanity Fair after-party, custom cane in hand, Blair appeared in an interview with Good Morning America's Robin Roberts. During the candid conversation, the 46-year-old longtime actress revealed how the chronic illness has impacted her body and her speech. "I am very happy to see you, being able to just put out what being in the middle of an aggressive form of multiple sclerosis is like," she said, her speaking audibly affected. "I have spasmodic dysphonia right now." The star further reflected on how she finally got diagnosed after knowing for years that something was wrong. "I cried," she recalled. "They weren't tears of panic. They were tears of knowing I now had to give in to a body that had loss of control and there was some relief in that." As the single mother revealed, she had been unknowingly in the midst of a multiple sclerosis flare-up after her son, now-7-year-old Arthur, was born. "I was giving it everything to seem normal and I was self-medicating when he wasn't with me. I was drinking. I was in pain. I wasn't always drinking, but there were times when I couldn't take it and I was really struggling with how am I going to get by in life and not taken seriously by doctors," she told Roberts. According to Blair, her symptoms were explained away due to her being a new mother, like exhaustion and facing a financial burden. Meanwhile, the underlying multiple sclerosis continued to take its toll. "I dropped my son off at school a mile away and before I got home, I'd have to pull over and take a nap and I was ashamed and I was doing the best I could and I was a great mother, but it was killing me," she candidly said. "So, when I got the diagnosis I cried with some relief, like, 'Oh good, I'll be able to do something.'" As for the most important person in her life, her son was worried at first when Blair shared the news. As she noted, he had already been seeing the symptoms. "He almost cried and said, 'Will it kill you?'" she recalled. "I said, 'No. I mean we never know what kills us, Arthur. This is not the doctor telling me I'm dying.'" His response? "He was like, 'Oh, ok,'" she imitated nonchalantly. Looking ahead, the star might experience improvement. "[The doctor] said within a year, I could have, at the time he said, 90 percent of my abilities back, so this is to say let's meet again next year and see if I'm better," Blair told Roberts. "If I'm not and I can still have a conversation, that's good enough." Ultimately, the actress understands what kind of an impact she has not only on her own well-being, but also on other people facing multiple sclerosis. "I was a little scared of talking [in the interview] and even my neurologist said, 'No, this will bring a lot of awareness because no one has the energy to talk when they're in a flare-up." Her humor very present, she added, "But, I do because I love a camera."